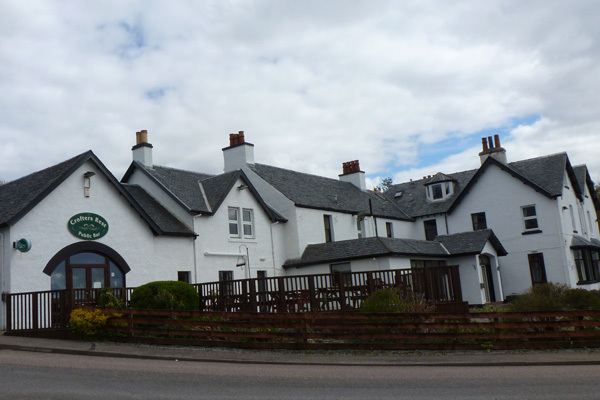 The Arisaig Hotel is an old Coaching Inn situated by the water in the lovely village of Arisaig. Our mouth-watering, good value meals can be taken in the Crofter's Bar, the Lounge Bar or, in summer, in the Dining Room. If it's sunny you can soak up the rays and admire the views from the deck. If it's cold you can curl up in front of the fire in the Drawing Room. Lunches and dinners, teas and coffees with home baking are served daily to residents and non-residents. Our chefs prepare all the food on site, using fresh local produce where possible, and create some real treats! Children are welcome in all areas; there is a playroom for younger children and a pool table in the Crofter's Bar. Kayaking and bike hire are available from the hotel.